The only game I played at DuckiCon that didn't start with the letter C was Keyflower. I have played Keyflower twice previously and its a game that I really really enjoy. This time round we managed to add in the farmer expansion as well to see how it changes things up compared to the base game. 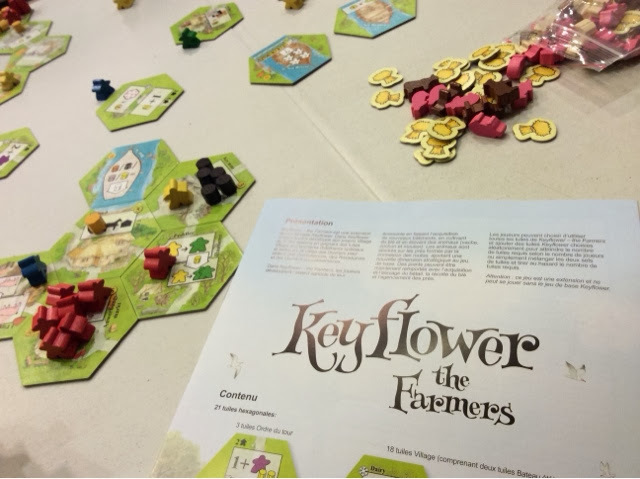 Since I have never written about Keyflower before, I shall start with a brief look at how the base game plays. Keyflower is mostly a game about set collection and auction. The game lasts 4 rounds ( one per each season of the year ) and points are tallied right at the end to determine who is the winner. During each round, a certain number of tiles will be revealed and will be up for grabs between all the players. This is where the very interesting auction mechanic will take place. The tiles are hexagonal in shape ( 6 sided tile ) and are bid for by placing meeples next to the side that corresponds to you. What does that mean you say ? Well, Keyflower plays up to 6 players, so when played at its maximum number, each player is assigned a particular side of the tile. So whenever there are meeples next to the tile on a particular side, you will immediately know who is the player who is bidding for it. In lesser player games, you will just choose which side you would like to represent you. The auction in Keyflower is very simple in execution but very clever in its implementation. As mentioned, when you want to bid for the tile, you will place however number of meeples you like by the side that corresponds to you. The important thing to note is the color of the meeple. Because in Keyflower, there are 4 colors of meeples ( yellow, red, blue, green ) in play. The color is important because the first player that places any meeple on or next to the tile will ultimately determine the auction/bidding condition for that particular tile. So if I was the first bidder and places 2 red meeples on the side of the tile, then anyone who wants to outbid me has to place a higher number ( 3 or more ) and the meeples must all be red in color. This means that the currency for a tile fluctuates depending on who gets there first. So going first may be somewhat important especially if there is a tile you are really hoping to get. Letting someone else dictate the color for bidding can really mess with your plans when you have a low number of that colored meeple. Another interesting aspect of the auction is that you don't need to win the tile to use its ability. Instead of bidding for the tile, you may place the meeple on the tile. By placing meeples on the tile, 2 things happen. You get to execute the ability of the tile immediately, and the meeples that remain on the tile will go to the player who won the bid for the tile. That's one way on how a player may refresh and get more meeples. So, if I can use the ability without winning the tiles, then why would I want to win it in the first place ? Well, 2 reasons. The first is that the tiles usually give you points when the tile is upgraded. The second reason is because the tiles are mainly resource generation tiles. For example, some tiles let you produce wood or stone that are required to upgrade tiles or are part of the set collection end game scoring. Other tiles let you exchange your meeple color, or when upgraded, actually gives you a better exchange that isn't just one for one. Also, by winning the tile, you may use its ability on later rounds by putting your meeple on it. 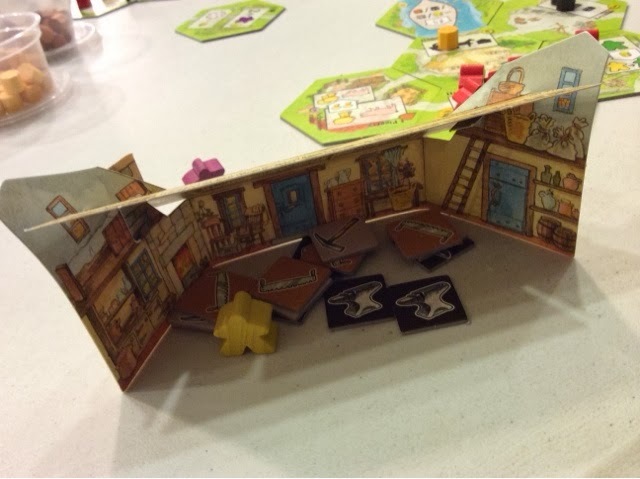 This not only confers you the ability, it also lets you keep your meeples for the next round ( only meeples that are placed by the tiles up for auction are lost, any meeples on your own tableau are always returned to you. losing bidders also get their meeples back ). Other players may also place their meeple on your board, they will get the ability, but you keep the meeple. Think of it as paying for your services. Thus, winning a tile is usually what you want to do, but in the case where you can't win it, you can always take the action by paying a meeple or so but you let the other players get more meeples for future use. 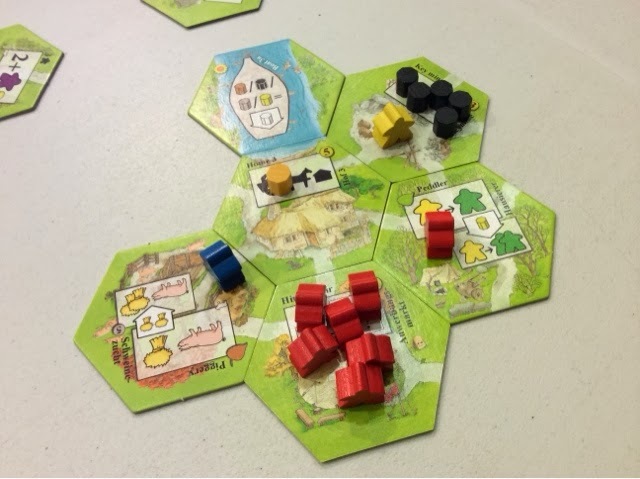 The auction does not only just give you new tiles to build in your village, it also consists of bidding for turn order and the chance to get new meeples of multiple color types. Each round there will be boats of meeples that come into the village. Some of the boats are definitely not as good as the others either because they have a low number of meeples, or they may come without any resource tiles on them. So players also bid hard to have first pickings of the new boatload of meeples. This is the main way that you are able to increase your meeple count and color type. 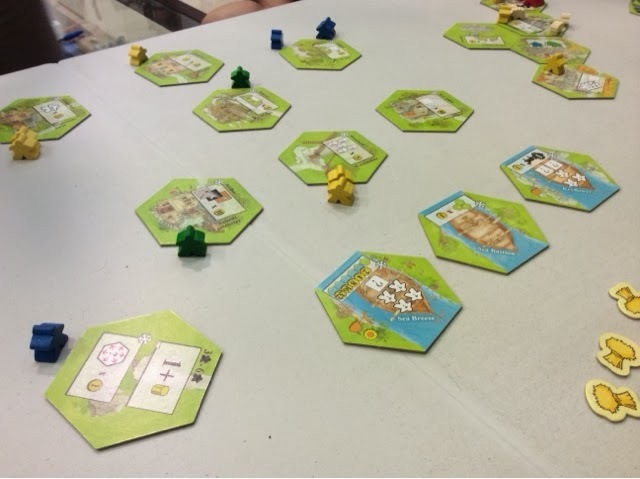 So this proceeds for 3 rounds where players try to build their village in a way that allows them to balance between meeple regeneration, resource production, tile upgrading, and set collecting. There is much to do in Keyflower but yet very little time or resources to accomplish all that you hope to do. In Winter ( the last round ), things change up as you no longer bid for random tiles that come up, instead, you will be bidding for specific tiles that you knew at least some of right from the beginning. At the start of the game, you will be given a handful of tiles that determine how points are scored at the end of the game. For example, a tile may reward you points for each same colored meeple you have at the end of the game. Another could have given you points for sets of resources or tiles that you have collected. So from the onset you know what you hope to aim for, but it doesn't necessarily mean that you are the only one who was aiming for it. These tiles that you saw may now be placed up for bids by all players. I say may because you may choose not to play it in the game and just discard it ( perhaps you didn't manage to make the set you thought you could have ). But nonetheless, each player must place one tile up for bids. So as you can see, you may have set yourself up for big points thanks to a tile, but you still have to make sure that you win the bid for the tile. If not, whatever you have collected may come to none. That's Keyflower in a very small nutshell. There are other stuff to note like how you have to move resources about to perform an upgrade, or how there are boats that you can bid on that give you ongoing special abilities. But the main gist is that you are bidding for tiles and using them to channel into efficient set collection and resource production. As a base game, I think Keyflower is fantastically fun to play. Its not extremely long as the game only lasts 4 rounds. But those 4 rounds are full of tense moments and very interesting meeple play. Bidding in color and using them for tile abilities will make you double and triple count how many you want to commit to a certain cause. The variability in the tiles and the boat special abilities also make the game different each time. The fact that not having won the tile doesn't disqualify you from the tile's ability is also good. You may have to give meeples to your opponents but sometimes the price is right. It also doesn't take very long for a full compliment of 6 players. I think my two 6 player games took less than 2 hours each. Our one 3 player game ( with expansion ) possibly took slightly over 1 hour due to unfamiliarity with the expansion tiles. Keyflower may be difficult to first pick up though. I remember I had some issues understanding the movement of resources and the upgrading of tiles. There are some nitty gritty rules to grasp and they may ( possible will ) not be easy on the first play. I tend to dislike small event specific rules in games but because Keyflower is fun, I really do look past it. 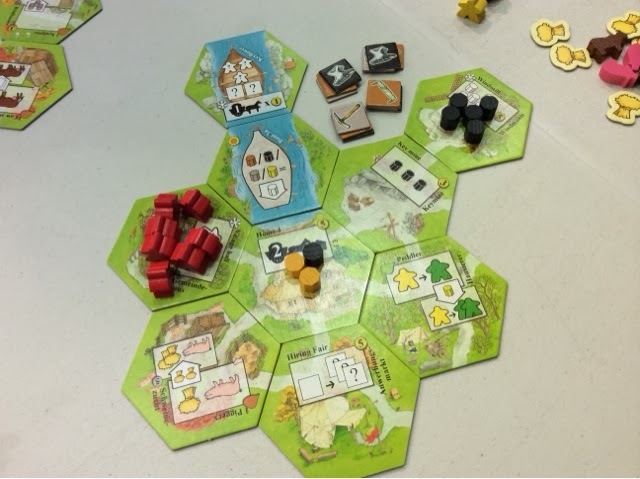 For example, winning the turn order tile on the Winter round means you get to place it into your village and score 1 point per tile it connects to. I can NEVER remember that rule ! I always always forget to build my village to accommodate that last tile. Irritating. The iconography in Keyflower is also top notch. Some may need re-clarification, but most are easily understood and quite unforgettable. 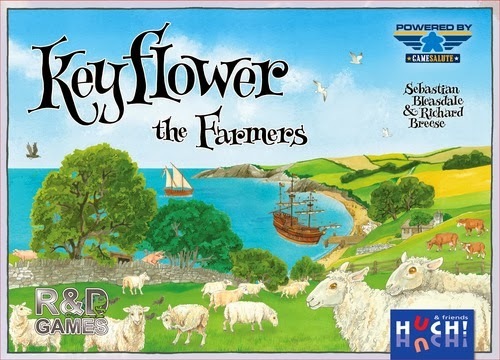 Also, I generally don't quite like auction games ( unless they are short fillers ), but Keyflower is probably the one exception to the rule. But overall, you will be hard pressed to find a better set collection game out there than Keyflower. It is in the BGG top 100 ( nearly breaking into the top 50 ) for a reason. Its auction mechanism is unique, its bidding aspect adds a whole new dimension with the element of color, and the way you have to manage your meeples and your resources can be downright difficult. You won't be successful in everything you do, but if you can do some bits right and well, you will be racing for the finish rather than being left behind. I obviously can't do anything right in Keyflower, because I have lost every game I have ever played of it. Haha. I do think I would have won two of the three though, if only is all I can say. What then about the farmers expansion ? Well, the expansion is really a small expansion if you ask me. It adds new tiles and new resources to generate. But that's about it. The new tiles involve generating wheat and 3 types animals ( cow, pig, sheep ). The animals are stored in your village by fields that are formed between the tiles ( Carcassonne style ). How do these new elements effect the game ? Well, the wheat allows you to move your resources one step further than you normally would be able to. So if my initial power was 3 movement points, with one wheat I can now move up to 4 movement points instead ( yes you may stack the wheat, pay more to move more ). The animals allow you to score in a way guaranteed points without any end game scoring tile. So per animal field you have, you will score points depending on what type of animal it is. You don't get points for multiple animals in a field ( unless you won the end game tile ), only per field you have. So multiple fields of sheep is better than an extremely full field of sheep. What do I think of it ? Personally, I think the expansion is rather unnecessary. The animal pieces look great and they add a new element of gameplay to Keyflower. However, I felt that the expansion kind of diluted the gameplay. The tile allocation and spread in the base game was great. Each tile can react and combo off a different tile to make acquiring both tiles great. The tiles in the base game also provided sufficient "cover/scope" so that you know that whatever happens or whatever tiles get revealed, you have a way to work towards your end game scoring tile. But now with the expansion, with multiple tiles in the mix, some of the tiles don't appear as readily as they should. This leads to some tiles becoming really useless and unattractive. And I never had the confidence that the tiles have sufficient ability to make my end game scoring work. The synergy has been lost so to speak. The animals seemed like it would be a fun addition, but I think that the way they are scored made little sense. You just want to get more fields of one animal. There's nothing to synergize with. Generating more animals doesn't reward you with anything. Not as if I could use them for something else ( unlike resources ). So it seems like its kinda unrewarding to pursue that route. If the scoring for the animals were different ( perhaps sets of 3 in a field, etc ), then having a tile that generates these animals might have been more rewarding. I don't know, its only one play so far, but, color me unimpressed. Keyflower base is great. Everyone should try it out to see if its something they will enjoy. 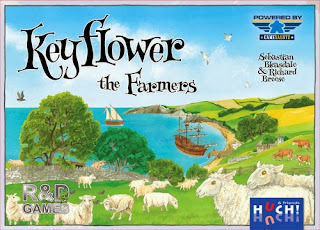 Keyflower the farmers expansion is a miss for me. Don't need it, don't want it. I won't object to playing with it but its not that important to me when I look at the overall scope of the game. Another well written review ......... keep up the good work!